92. Emerilware Nonstick 3-Quart Saut? 94. 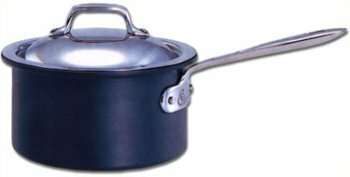 Emerilware Nonstick 5-Quart Saut? For those who love to cook and hate to clean!! Emerilware nonstick cookware is amazing! 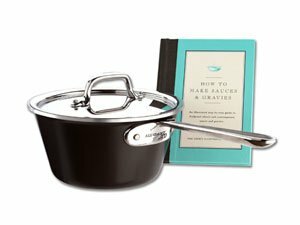 I have used this saucepan along with an arsenal of other Emerilware products for the past year and a half and I recommend it to everyone -- from those just beginning to cook, to those "seasoned" chefs! In fact, I just purchased the Emerilware nonstick 10 piece set as a present for my Mother. And, I am currently adding to my own collection. I can't promise this cookware will make you a better cook, but you will definitely have more FUN cooking! The cookware heats quickly and evenly and the handles stay cool... it looks great... the nonstick material is tough and durable (I've had NO problems with it peeling off in 1.5 years of hard use)... the nonstick layers allow virtually effortless cleaning -- even the worst messes just rinse away with a dab of soap and a sponge, with no scrubbing required!!! it's a lid. a lid. This is a lid. It fits All-Clad's six inch pots perfectly. It's shiny. It holds things inside the pot. The handle can get hot after a while, so be careful. The handle is nicely shaped and is easily held with two fingers. It's shiny. It's just a lid. Though if you didn't have a lid your sauce or whatnot might splatter across your stovetop, and wouldn't that be messy? Yay lids! How exciting can a lid be? When it's All-Clad, it's always exciting. Having cooked for almost 40 years, I can assure you that there is no better cookware than All-Clad. Beautiful, durable and efficient. Anyone thinking that food will stick to a stainless pan has either not tried All-Clad or is using faulty technique. Preheat the pan, lightly oil and it is better than any other product. The best. This lid if of the same quality of the ALL-Clad stainless pots and pans I purchased earlier this year. This particular lid fits both the 1qt and 2qt saucepans. Nice addition for a reasonable price. Combine with specially-priced 1qt saucepan for a great deal! All clad pans are great, with one caveat. This line doesn't have a rolled lip so that pouring is more difficult than it should be. Of course with a 4qt pan that usually isn't an issue. If you are strong enough to lift a 4qt pan by the long handle don't get this version, get the one without the lip. Why? Because the loop handle prevents both the steamer and the double boiler inserts from seating firmly. They work, but it isn't as good as the non loop version. 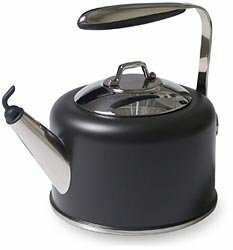 Now admitly using a 4qt pan for steaming is overkill, but if the 3qt version is in use, or you didn't buy that one too, you will wish you had the non loop version. The ultimate in beautiful, high-performance cookware, All-Clad's innovative Copper Core collection combines the unexcelled heat conductivity of copper with the easy maintenance of stainless steel. Crafted in a unique five-ply construction, the cookware contains a core of pure copper that spreads heat quickly and evenly across the bottoms of pots and pans and all the way up the sides. Aluminum layers bond the copper to stainless-steel exteriors and interiors. Enhancing the cookware's appearance, a stripe of the copper core elegantly encircles the gleaming, mirror-finish exterior. The interior is highly polished so it's stick- as well as corrosion-resistant. Rolled edges on pots and pans help prevent drips during pouring and ensure tight-fitting lids. Ever since receiving one as a gift, this piece has been the pride and joy of my cookware collection. Having a thick interior layer of copper, the pot is quite heavy, and conducts heat more evenly than the calphalon pan I used to use. The extra money for the copper core is definitely worth it. If I had the money, I'd stock my entire kitchen with this line. I never worry about things sticking to the bottom of the pot. The trick is to heat the pan on low to medium-low heat for a few minutes before putting oil in the pot, and then letting the oil heat for a few minutes until it begins to smoke. Stainless steel is much easier to clean than either hard-anodized aluminum or copper. Getting it clean enough to use is a breeze, although personally, I insist on scrouring it until it shines like new simply because I like this pot so much. Let me start by saying this is a great price for a piece of Emerilware--I bought it as a "tester" piece to see if I really wanted to spend $400 on the 10-piece set. And after using this small pan for a few weeks, I know I do. I don't fully agree with the other opinion that states the handle is top heavy, causing the base to lift off the stove (I think that's what was said--sorry if I misphrased). I think it's just a matter of the handle being somewhat longer, which makes it a bit uneven feeling. However, that said, I have had no problems cooking with it. (In about 20 uses, the pan has not tipped over once!!) If you're worried about it, I think you may just want to be careful not to leave the handle of the piece hanging out over the edge of the stove where you might bump it. One other note: after having used other non-stick cookware and being used to using "Pam" style sprays to cook with, it has been a hard habit to break with the Emerilware pan. It is stated clearly in the instructions that you should NEVER use aerosol sprays because it can gunk up on the pans and is extremely difficult to clean. With these non-stick pans, you really don't need any coating, and when you feel you do, a bit of olive oil or butter works wonders. I can't wait to get the full set!! I've been using this pan for nearly a year and love it. The fact that it's non-stick goes without saying. It's the perfect size for a 2-egg omelette. The slope sided design makes hand flipping of saute'd mushrooms, onions, etc. a breeze. The pan and the handle are definately not unbalanced, and the handle is very ergonomic. The hard-anodized aluminum exterior still looks almost new. There is absolutely no sign of wear on the interior. Overall, it has a solid hefty feel that makes it an absolute pleasure to cook with. I am so impressed with this skillet! The handle truly stays cool. I plan to buy a whole set. Emerilware 8 " Fry Pan: Good buy / Great quality / Love it! Emerilware 8" nonstick frypan delivers what it promises. I love the way it fits in your hand and the security of the thumb depression. The weight gives very even heat and gives you the feeling of quality materials. The nonstick surface is durable, cooks accurately and is the easiest cleanup of any I have used. I also have the 10" which I love and I hope to eventually own a whole set. Works as advertised for a reasonable price. 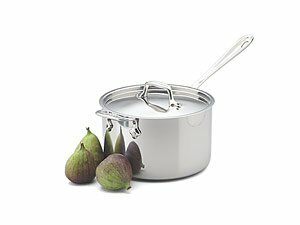 Awesome little pot . . . .
Love the stainless All-Clad line, and I have many pieces. I am not happy with the tea kettle. The "stay cool" handle gets very hot and if you want to use the whistle feature, you need to pull the piping hot whistle from the pour spout in order to pour out the water and put it back in after each use. Not worth the money. 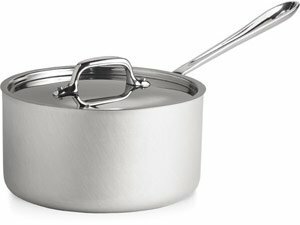 I got this pan because I've been coveting All-Clad when reading reviews of high-end cookware, and because of the low price. I figured that the low price made it a teaser--something to get you prepared to pay the fortune you need to buy other items in the line. It's a nice pan, but limited. On the good side, it's hefty, has a perfectly flat bottom for good contact with the stove, heats evenly and holds the heat. It is not non-stick, so I use it when I want the contents to produce the fabled "brown bits" that come up with deglazing. Stuff sticks, unless you use a lot of fat. As noted by other reviewers, it does not have a pouring spout. The rim is squared off, so the pouring stream tends to be very wide. My other major gripe is that it does not have a lid. All-Clad lids are pricey, like everything else in their line. I sometimes use a cheap tempered-glass lid with it. I still covet All-Clad pans, but not as much as I did before. I ordered this pan a few months ago, and I would like to say I couldn't be happier with it. This little pan is the perfect size for one or two servings of oatmeal in the morning. It heats like a dream, with no hot spots, and even heating up the sides. To top it all off, cleaning this pan is incredibly easy, with hardly anything sticking to the smooth steel interior. The one downside to this pan is the anodized exterior can scratch, and did on mine, but I don't really care what this pan looks like as long as it cooks well. If you're looking for a small pan, and don't need a lid for it, I strongly recomend this one. This pan is handy, heats evenly, and is a good value for the money. However, I have one significant issue with it. It doesn't have a pouring lip. That means if you try to pour a liquid out of it, it will likely dribble down the outside of the pan. 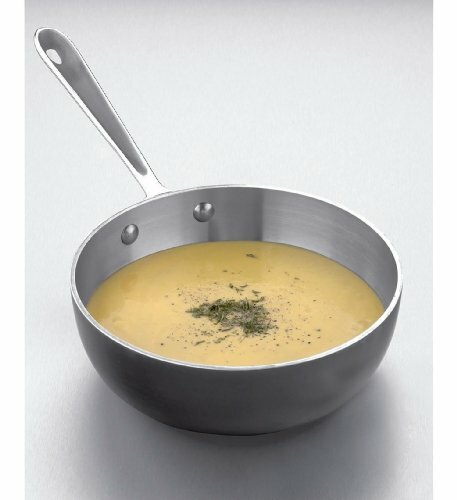 Many other sauce pans and even some other All-Clad pans do have a pouring lip. This is a significant and unfortunate omission. I get a lot of use out of this pan. Specifically, I often use it to melt butter and sometimes to do a quick sauté of a small quanity of ingredients, like chopped onions. I think this is good value for the money. However, I find a couple of significant flaws. The first is common to all All-Clad pans. The V-shape handle is not as comfortable as it could be. Compare the handle to that on higher-end lines like Demeyere and Bourgeat and you'll see that All-Clad falls behind. Calphalon, ..., did a nice job with the shape of the handles on their Professional series but the handles can get hot. When they designed the Commercial series, they went with a copy of the flawed All-Clad handles which is unfortunate. More importantly, considering that this is a sauce pan, it should have a proper pouring lip. Without such a lip, pouring liquids is problematic. All too often, liquid will run down the side of this pan requiring more care than should be necessary. Some of the larger All-Clad pieces, such as the 8-Quart Stockpot and the frying pans do have a good pouring lip. Such a lip is probably most important on a sauce pan so I find this quite a shortcoming. I would definitely recommend the LTD and Master Chef lines over the Stainless unless you absolutely need to be able to use the dishwasher. The Master Chef and LTD lines both have 0.44mm stainless steel on the interior and 3.94mm of aluminum on the exterior while the Stainless series has an interior of 0.44mm, an aluminum core of 2.03mm, and an exterior of 0.46mm. Thicker aluminum will provide more even heating. If you have used All-Clad before, BEWARE: this is All-Clad only in name, not in quality! I have used All-Clad from many years and have about a dozen pots and pans from their LTD line and each and every one of them I LOVE. Unfortunately, it appears that you can no longer purchase pots of that quality and although the All-Clad label still exists, their quality is very far below that of the older pan I have. I cannot recommend them....and this is very unfortunate because I have been very, very vocal in the past about how wonderful their product line was. Recently I purchased this pot because I couldn't resist the price...and I am returning it as I have all the other recent LTD All-Clad purchases I have made. 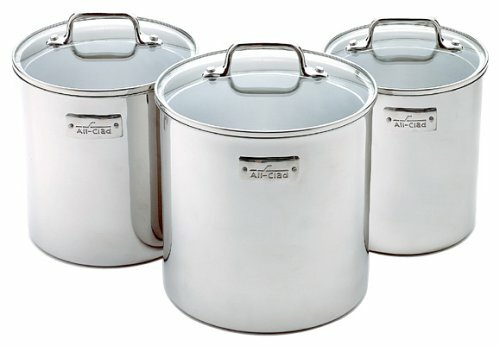 All six LTD All-Clad pots I have purchased recently are made in China (my old pans were made in USA). Three of the pots I returned immediately because of flaws in manufacturing. Of the remaining three, I have used two, both of which I cannot get clean (after much effort) and both of which after only one use look much older then LTD pans I have used daily for many years (and those pans still clean effortlessly!). Do not buy this product if you are an All-Clad customer! I have not used another product for many years so I can't say how these sub-standard pans perform compared to other companies products, but I would look there before spending the money on these cheap nock-offs. A world-class collection of nonstick cookware, Emerilware bears the signature of celebrity chef Emeril Lagasse (Bam!) and was created in partnership with renowned cookware maker All-Clad. Durable, heavy, and beautiful, Emerilware combines the contemporary style of charcoal black hard anodized-aluminum with the contemporary ease of nonstick. The exceptional thickness (5 mm) of the aluminum and three layers of tough nonstick provide better heat retention and scratch-resistance. Ideal for low-fat, healthful cooking, Emerilware carries a lifetime warranty against defects. I have used high-quality pans from several manufacturers, but this one is the best of its kind. I was thrilled to find this 3 quart, 10 1/2" saute pan after a long search. 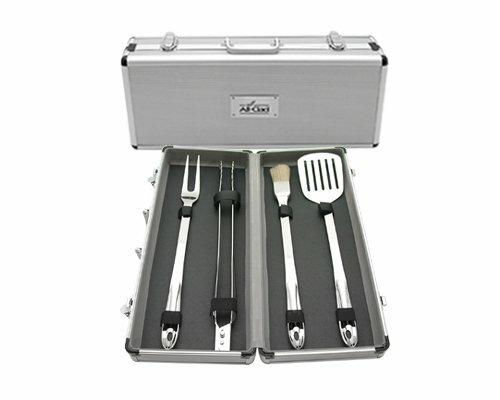 Its size is ideal for cooking a recipe for two or three people. Emerilware is made by All-Clad, known for its high-quality products. Emerilware has some of the good All-Clad design features, but it is superior in both cooking results and design. The pan's heavy aluminum construction - thicker even than other high-end pans - makes for perfectly even heat transfer and quick cooking, even on lower heat, without a lot of fiddling to move contents around in the pan. This trait is important when you want to get an even, crisp crust on the surface of the food, as to do that you need to avoid moving it around in the pan. The Emerilware line's heat transfer is surprisingly MUCH better even than my other non-stick All-Clad pans. Its design features also offer several advantages over other brands. The pan's slightly curved interior corners make it easy to get the edge of a spoon or wisk (avoid pointy metal implements, of course) into the corners when making a roux or sauce. The non-stick interior is also heavy, smooth, and tough. The domed and lipped lid fits snugly and is the ideal design to make the pan useful for many cooking tasks. The pan's weight makes it very stable, and the rather narrow handle works surprisingly well for the size and weight of this pan. When I first saw this signature All-Clad handle design, I thought the little thumb-rest might be a mere design frill, but it really makes the handle easy to hold and feel more stable in the cook's hand. 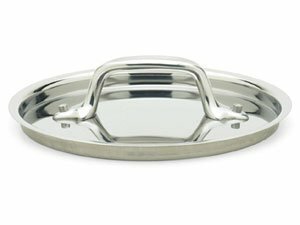 The sturdy looped helper handle on this mid-sized pan is a generous touch seen more commonly on well-designed larger pans, which can be heavy when full. 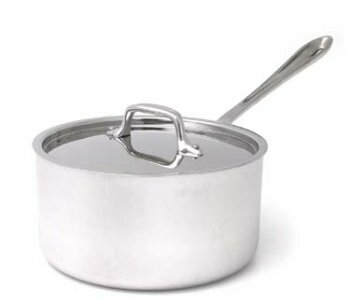 Though the metal handles are not advertised as stay-cool material, in my experience, the pan handles do stay cool, though the bail handle on the stainless steel lid does eventually heat up. All the Emerilware pot and pan lids (and other All-Clad lines) have large ergonomically-designed bail handles that can be grasped easily even with a pot-holder. An extra nice touch for storage: all the Emerilware lid handles can be slipped easily over the pan handles to hang the two pieces together on one pot hook. I've had this for a bit over a year. The quality is outstanding. My only complaint is that it's a bit heavy to maneuver with one hand. Fortunately there is another handle opposite the main one, which make the process easier. This is the most wondrous piece of cookware I have ever owned. It has everything going for it: even heating, large size, long stay-cool handle, dripless pouring, absolutely THE BEST non-stick, super-easy clean-up, attractive appearance. I use this pan so much that I never put it away in a cabinet...it stays out on top of my stove all of the time. No problem, because it is a beauty! Yes, it is heavy, but the helper handle makes it manageable when washing. 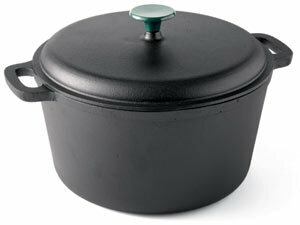 Because of its heavy, solid construction, I have never burned anything in this pan. This pan was my first Emerilware purchase. Experiencing its virtues caused me to replace my entire collection of pots and pans with Emerilware. I HIGHLY recommend both the nonstick and stainless lines. The Emerilware Nonstick 5-Quart Saute Pan is a pleasure to cook with. 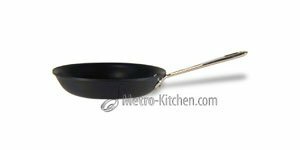 The nonstick surface is very durable and requires little to no fat when cooking. It heats up evenly, even on a medium to low heat. The only downside to the pan is that it is quite heavy. The weight of the pan makes it cumbersome to clean. I have also noticed that the outside of the pan tends to scratch easily, but this does not affect the performance of the pan. Furthering the debate on the applications of the hanging tool rack.. 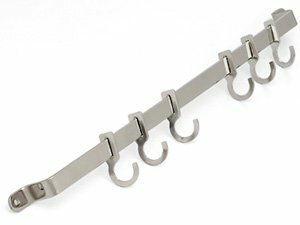 Mounted properly to a secure point, the hanging rack can hold pots and pans without a problem. The weakest possible point on this structure will be the fastening points of the rack to the wall. The hooks are stronger than pretty much anything that can be screwed in to the holes. The strength of the rack itself couldnt possibly be in question, its made of 18/10 stainless steel, you would need 100's of lbs of force to bend it. The rack is easily capable of holding pots and pans on every hook that weigh 10+ pounds. Maybe it was not designed to hang items as wide as a pan but this does not mean you cant buy 4 racks and still do it, they are very good looking. Just because its called a "Hanging Tool Rack" doesnt mean you cant hang on it anything that can be hooked, everything you buy has a suggested use. Buy it and do what you like, bolt it to the wall in the garage and hang hammers on it, wont hurt my feelings! Despit what another reviewer says of this product--it is NOT a pot hanger--it is a TOOL (fork, spoons, whisk, turner, etc) HANGER. It has six hooks for tools--you can get more directly from ALL CLAD ($5 for 4 additional hooks). The finish on the rack is pure ALL CLAD, first rate. However, the finish on the hooks is not quite up to par. But do not let that stop: with tools on it you cannot see the hooks. While it is great for hanging the teriffic ALL CLAD tools, don't even think about hanging pots/pans on it-that is NOT what it is designed for. BINGO! No more falling pots and pans! Stainless steel interior which will not react with foods. Each canister features an air-tight glass lid. Perfect for storing dry goods.